I am on my way, right now, to visit family for the week. It will be a fun and busy week, as we'll be celebrating Thanksgiving, early Christmas, and participating in a wedding shower for my sister. Whew. I'm not very good about getting gifts made ahead of time (or even on time, for that matter), but I did manage to create a keepsake for my parents and grandparents that I am pretty excited about. Simple, but sweet. I was inspired by this embroidery project at A Number of Things (via Kelly at Almost Frugal-who kindly included my clothespin dolls in her list of handmade holiday gifts). Alice embroidered the outline of her son's hand which he had traced himself. While my kids aren't really up for that yet, I thought it would be a great way for me to capture their prints. I've never done the traditional plaster prints or even painted ones. I traced their hands on paper, cut out the shapes, then traced those onto my fabric (you can get fabric transfer paper, but for an outrageous price). Next, I embroidered them all inside a 12" hoop. I kept it simple, with just their initials and the year. I painted the hoops (I didn't have a chance to photograph the other one which is designed a bit differently) so they could be hung as is, keeping enough extra fabric behind that they could be pulled out and framed later, if need be. My kids were excited to see their hand prints sewn into the fabric and liked the thought that next Christmas they'll be able to put their hands up next to the prints and see how they've grown. This was my first time to embroider anything. I'm definitely going to do more of it. Update: I've answered some of your questions about this project and given you some embroidery instruction links here. That's so cute! Nice work. Love this idea! Good job embroidering for the 1st time too! Love it....just curious, I've never embroidered before & thought about tackling this, what kind of fabric did you use? 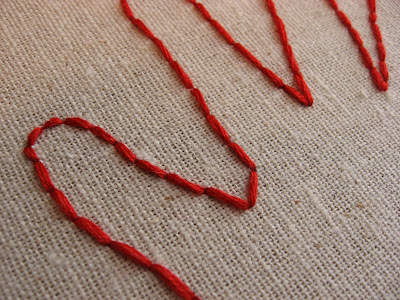 And do you know of a good web tutorial on how to embroider? Thanks so much, too cute! love it! what a great idea. Have a fun week with your fam! I can't BELIEVE that is your first embroidery project! It. Is. Awesome! These are great!! I love it. What a precious gift...I'm sure that will be cherished for a long, long time! First of all, I'm glad to see that I was mentioned on your blog. Happy day. Second of all, I thought we weren't getting the grandparents gifts this year?!? Now that is absolutely adorable! Love it!! I absolutely love this idea! I wouldn't doubt my mom would be proud to hang one like this in her house. I have 5 kids, so this will be pretty interesting. But at least it looks to be a simple project to do. As a matter of fact, I could probably include my brother's kids next time (or this time... time depending). Thanks for the great idea!! Oh! What kind of fabric did you use? I absolutely adore this idea! Maybe I'll get to it next year! Well it looks great for your first emboroidery! 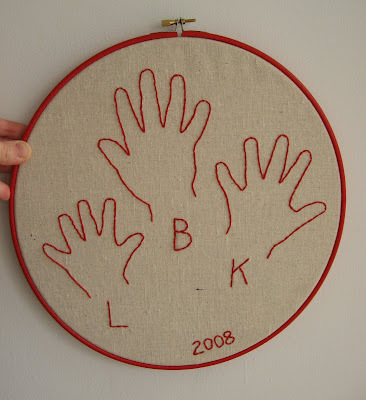 I think this is a great idea, i love stitching, and would love to preserve my kiddos handprints! Very cute that you can compare the sizes between the kids also. I love this! My Nana has a pillow with the cousins handprints embrodered on it. I remember growing up and always comparing our hand size. Fantastic idea! I only have one child, so I'm picturing a layering of three handprints; my husband, mine and my son. Maybe like: we are blue and yellow= he is green. Would be a great gift for those "have everything" grandparents. This is beautiful! I can't believe it was your first attempt at embroidery. You are making me think I could almost do this! I also would love to know what kind of fabric, what kind of stitch... Oh and about how long did it take? These charming handprint gifts were very well-received...I can say that because I was one of the blessed recipients! Ours will be in a place of honor where we can view it many times each day. 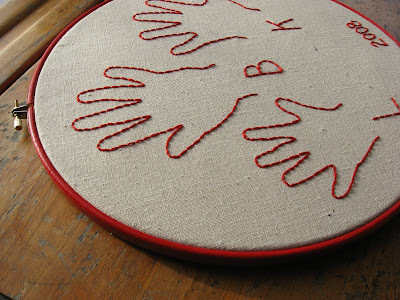 I absolutely love the idea of these embroidered handprints. I saw this recently somewhere else in the blogosphere...I've got to try it myself! thanks! I adore this idea! I just linked it in my weekly Things to Write Home About post. I just bought a hoop to make one of these for my mama for her birthday in Feb. We have a little one coming in Jan. and a 2yr toddler. I'm hoping my first embroidered gift turns out as well as yours. Thanks for sharing. Such a lovely idea! Hello by the way, I'm a first time visitor. That is so cute! What a great idea! SUCH an amazing idea! Thanks for the inspiration. Hi Megan, I just found you through Amy Clark's blog. I'm so glad I did! Your blog is so inspiring. You have a lot of really great projects and recipe ideas. I'll definitely be back for more! I've been looking for gift ideas for my parents. This is the perfect one!! What a great idea! Can't wait to do this for our family! Awesome way to get started on Artfire. Our daughter traces our grandkids hands, cuts them out, measures the width of their arm spand, cuts a pink or blue ribbon and glues them to the pink and blue hand prints. Them she sends to us so we always have hugs!!! They mean so much when they aren't near to hug and hold! She also puts a picture on them. Happy Hilidays! What a great idea!!! Going to try this today. I fell in love with your idea here, just as soon as I saw it! I blogged about it over at my blog and even linked you to it! I can not wait to get started on mine... craftingwithrhinos/blog name btw. I'm such a sucker for capturing hand and footprints. I love it! Love this so much I finally made one for my Mother in Law as a Christmas gift this year with handprints from her three granddaughters. I blogged about it and linked back to you -- thanks for the great inspiration! cool blog even my blog http://create-websiteblog.blogspot.com/ has quite alot info you blog still helps, check out http://create-websiteblog.blogspot.com/ for more info. 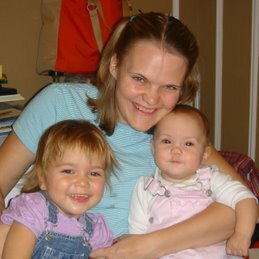 Hmm, I thought for sure I got the idea to do the embroidered handprints was from you, but somehow I managed to do one for my daughter's first Christmas in 2007? Anyway, I linked to this on my Handmade Christmas post, and there are pictures of the first two that I made. The one for 2009 wasn't done yet when I took the picture. :>) Thanks! What a great idea. I love capturing their sweet little handprints in either fingerpainting (fastest) or a medium like plaster or resin (slower and more problematic. This is a very cool way to do it. Thanks for sharing ;) You always have such great projects. A Mortgage Calculator is a tool you can use to figure out what your estimated mortgage payments will be and is based on the value of the home, interest rates, loan amount, loan length, and more. Our Mortgage Calculator can be used by anyone, whether you are in the real estate business, or just a current or future home owner. If your interest rate changes, you can use the Calculator to see what impact it will have on your monthly payment. I believe everyone must look at this. Very happy to see your article, I very much to like and agree with your point of view. Thank you for sharing. At the same time,i love best pram very much .wedding dressesWelcome to look at my website and blog articles.Hope we can become good friends, and exchange and to help each other! Thanks!! Really great post, Thank you for sharing This knowledge.Excellently written article, if only all bloggers offered the same level of content as you, the internet would be a much better place. Please keep it up! This is a really good idea and I love it! Its such a good idea and I will have to show this to my wife. She is looking into more of the embroidered gifts and custom things too. She would like this one though. Great job! I love to quilt soooo I am going to make squares with my grand-children's hands, names and birth dates (no more forgetting!!) When (and if) I finish it I'll send you a photo! THANKS so much for a great idea! !